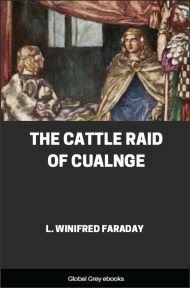 One of the masterpieces of Irish literature, this is a translation of a story cycle which lies at the core of the saga of Cuchulainn, the son of the God Lug and the daughter of the king of Ulster. Cuchulainn had the strength of Hercules, but was slow in gaining control over his powers, which turned him into a monster, leaving a trail of mayhem in his wake. At the age of seventeen, still beardless, Cuchulainn single-handedly repeals an invasion of Ulster by Queen Mebd of Connacht to steal the mythic bull Donn Cuailnge. Another translation of this story, The Cattle-Raid of Cooley by Joseph Dunn can be found here. A great hosting was brought together by the Connaughtmen, that is, by Ailill and Medb; and they sent to the three other provinces. And messengers were sent by Ailill to the seven sons of Magach: Ailill, Anluan, Mocorb, Cet, En, Bascall, and Doche; a cantred with each of them. And to Cormac Condlongas Mac Conchobair with his three hundred, who was billeted in Connaught. Then they all come to Cruachan Ai. Now Cormac had three troops which came to Cruachan. The first troop had many-coloured cloaks folded round them; hair like a mantle (? ); the tunic falling (?) to the knee, and long (?) shields; and a broad grey spearhead on a slender shaft in the hand of each man. 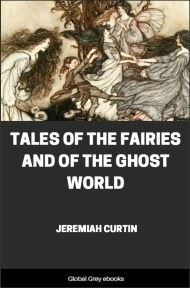 The second troop wore dark grey cloaks, and tunics with red ornamentation down to their calves, and long hair hanging behind from their heads, and white shields (? ), and five-pronged spears were in their hands. 'This is not Cormac yet,' said Medb. Then comes the third troop; and they wore purple cloaks, and hooded tunics with red ornamentation down to their feet, hair smooth to their shoulders, and round shields with engraved edges, and the pillars of a palace in the hand of each man. 'This is Cormac now,' said Medb. Then the charioteer turned the chariot, and they set forth. Then they saw a full-grown maiden before them. She had yellow hair, and a cloak of many colours, and a golden pin in it; and a hooded tunic with red embroidery. She wore two shoes with buckles of gold. Her face was narrow below and broad above. Very black were her two eyebrows; her black delicate eyelashes cast a shadow into the middle of her two cheeks. You would think it was with partaing her lips were adorned. You would think it was a shower of pearls that was in her mouth, that is, her teeth. She had three tresses: two tresses round her head above, and a tress behind, so that it struck her two thighs behind her. A shuttle of white metal, with an inlaying of gold, was in her hand. Each of her two eyes had three pupils. 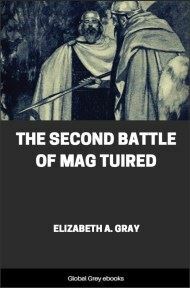 The maiden was armed, and there were two black horses to her chariot. 'What is your name?' said Medb to the maiden. 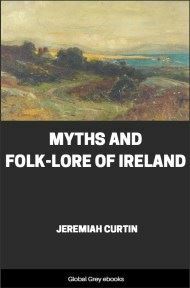 'Fedelm, the prophetess of Connaught, is my name,' said the maiden. 'Whence do you come?' said Medb. 'From Scotland, after learning the art of prophecy,' said the maiden. 'Have you the inspiration (? ): which illumines?' said Medb. 'Yes, indeed,' said the maiden. 'Look for me how it will be with my hosting,' said Medb. 'That is not true,' said Medb; 'for Conchobar is in his sickness at Emain and the Ulstermen with him, with all the best of their warriors; and my messengers have come and brought me tidings thence. 'Fedelm the prophetess, how seest thou our host?' said Medb. 'I see red,' said the maiden. 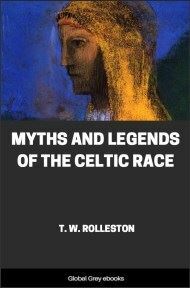 'That is not true,' said Medb; 'for Celtchar Mac Uithichair is in Dun Lethglaise, and a third of the Ulstermen with him; and Fergus, son of Roich, son of Eochaid, is here with us, in exile, and a cantred with him. 'I see very red, I see red,' said the maiden. 'That matters not,' said Medb; 'for there are mutual angers, and quarrels, and wounds very red in every host and in every assembly of a great army. Look again for us then, and tell us the truth. 'I see very red, I see red,' said Fedelm.